One of the 3 'Slave' films by Michele Lupo. The same cast and crew, and they somehow all look the same but they're not sequels or have anything to do with each other. And like all Michele Lupo movies, it's a somewhat odd mixture of super serious drama and uber slapstick action. Alfio Caltabiano is also credited as 'Maestro d'armi' or 'Master of arms' for this movie. Practically all productions he worked on, he also worked as the stunt or swords specialist. His stance in this screenshot is his signature stance. If I see actors in such a stance, I know Alfio worked on that movie, even if he's not acting in it. 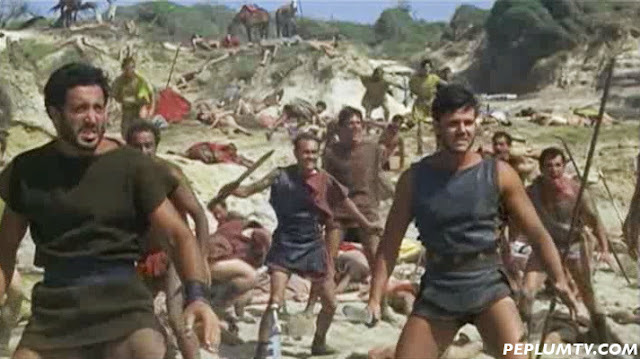 This Lupo movie is sometimes known as REVENGE OF SPARTACUS. In addition, this movie is not to be confused with another movie released the same year called REVENGE OF THE GLADIATORS, starring Mickey Hargitay.